This pretty crochet scarf it's a nice accessory to your outfit. 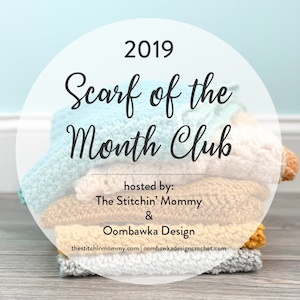 The yarn used for the pattern makes it perfect for warmer days, but if you'll work with thicker yarns, the scarf will be great also for winter. You can replace it with other yarn label and appropriated hook size. Gauge is not critical for this project. Based on your gauge, your scarf will turn out wider or skinnier. 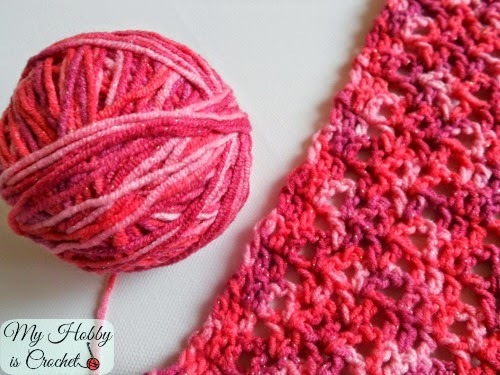 See the chainless starting double crochet stitches! No holes on the sides! Notes: If you prefer, you can replace the starting chainless foundation double crochet with starting 27 ch, then make a row of dc stitches. 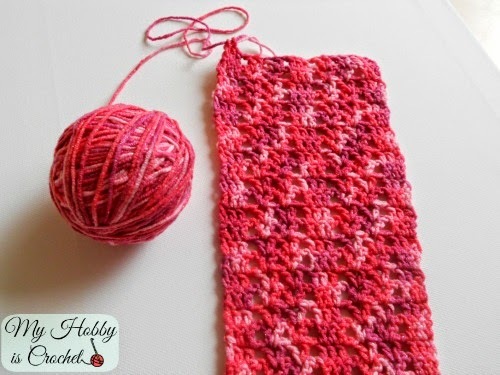 For a nicer look, without holes, start each row with chainless starting double crochet (csdc) instead of ch3; but you can choose what it works best for you. The csdc will look much better, if at the end of each row, you will first work the beginning csdc for the next row and turn your work only after. Repeat row 3 until you get to the desired length. I made 144 rows. Row before the edging: csdc, 1 dc into each st across, inclusive into the ch spaces of the V-sts. (25 sts) Turn. 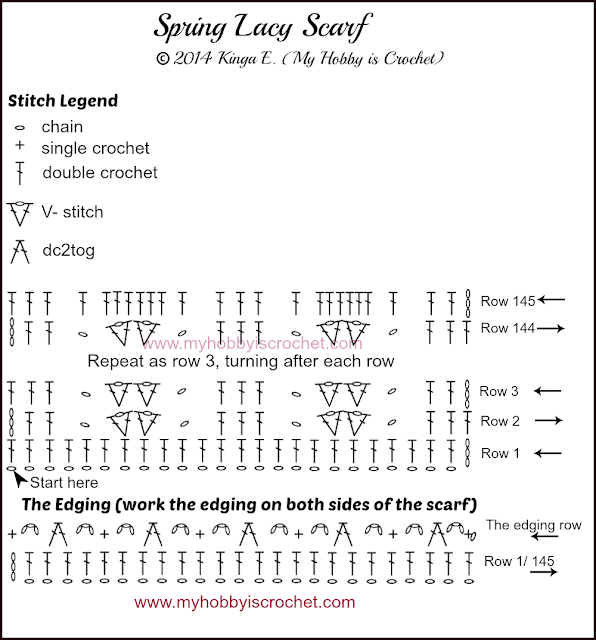 Edging: 1 ch, 1 sc into very first st, 3 ch, work 1 dc2tog, inserting the hook into next st for first leg of the decrease stitch, (3 ch, sk 1st, 1 sc, 3 ch, sk 1st, 1 dc2tog)x 4 times, 3ch, 1 sc into top of ch3. Cut yarn. Fasten off. Weave in the ends. Join yarn at the other end of the scarf and repeat the edging pattern above. I hope you enjoyed this pattern! 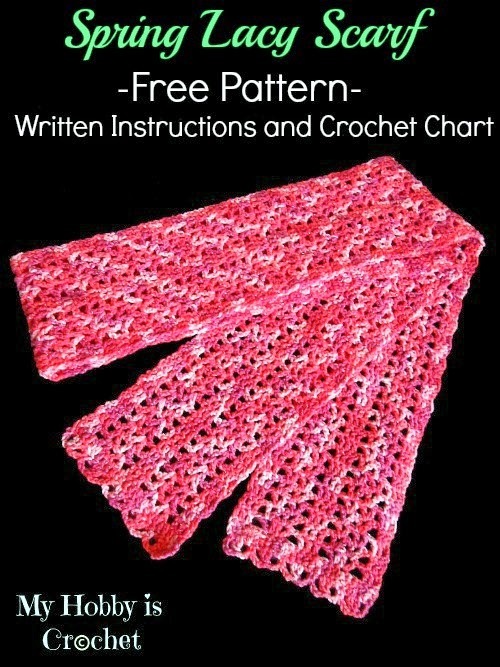 For more free crochet patterns and tutorial, please visit my FREE Crochet Pattern Page! This pattern is free for you to use, you can sell the products of your work, my only request is to link back to my blog. You are welcome to share this pattern on any social media sites only by direct link to My Hobby is Crochet! 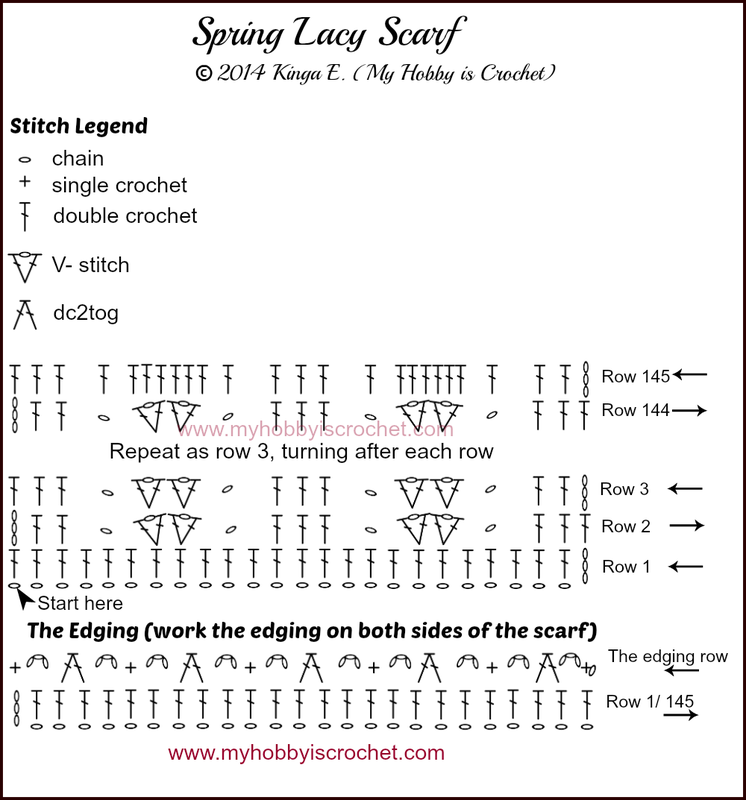 Please don't repost the pattern itself or the crochet chart to other sites.